A contemporary odyssey of a twenty-seven year old woman searching for fulfillment in friendship, love and artistry. Frances (Greta Gerwig) (“Ha,” the first two characters of her last name, provide the source of a closing sight gag) is a dancer in friendship-love with her roommate, Sophie (Mickey Sumner), who is on an odyssey of her own. Frances, meanwhile, ventures hither and thither looking for work and adventure. Eventually, she finds some fulfillment in her art, some evolution in her primary friendship, and the possibility of love. Greta Gerwig’s Frances is the main and obvious focus of this charmingly incoherent odyssey which takes the protagonist from one address to the other (the film is punctuated with postings of each new one), trying to fit together some picture of her life along the way. Gerwig’s gawky charm provides the main drive for this rambling adventure. Her character is a kind of mashup of Geena Davis’ gawky but fearless Thelma in Thelma and Louise (1991), Diane Keaton’s goofily endearing starring role in Annie Hall (1977), Jenna Elfman’s idiosyncratically magnetic Anna in Keeping The Faith (2000) and Lena Dunham’s Hannah in the HBO TV series, Girls (2012 -). In other words, she is offbeat, a bit out of kilter, full of character and all the more charming for it. The film rambles and is generally low-key, giving it something of the air of a Girls episode. In fact, Adam Driver, who plays Adam on Girls, shows up here as well. The result is a not unpleasant portrait of a post-adolescent character who is not quite put together but who gives the impression of seeking integration with a pleasantly discombobulated momentum. The driving motive is the friendship between Hannah and Sophie, which lends it a buddy movie feeling, with the trip as a psychological and emotional one through adolescence rather than one explicitly on the road. Noah Baumbach’s early, probing psychological drama, The Squid and the Whale (2005) (which made a name for Jesse Eisenberg, who went on to star as Mark Zuckerberg in The Social Network (2010)) was followed by two directorial efforts, the amorphous Margot at the Wedding (2007) and the insistently acerbic, not completely compelling, portrait of an antihero, Greenberg (2010), and a contribution as writer to the fabulously inventive animated classic Fantastic Mr. Fox (2009), co-written and directed by Wes Anderson. 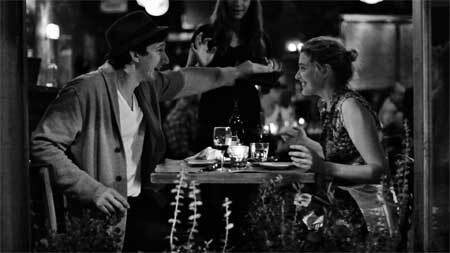 Frances Ha shows the same kind of focal analytic interest in a character demonstrated by Baumbach in Greenberg, but does it more successfully, with greater doses of irony and empathy. It is not a monumental film, but it is remarkably endearing, given how little there is to it. Some of that is due to Gerwig’s spontaneous and captivating portrayal and some to Baumbach’s devotion to his evolving form, a new, Brooklynite variant of cinematic New York stories for an emerging generation.